The Hill Fort Kesroli dates back to the 14th.Century. 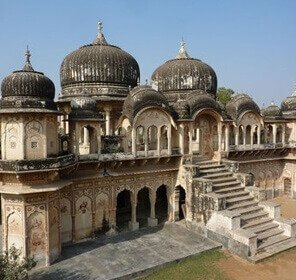 It was constructed during the reign of the Yaduvanshi Rajputs, who were considered descendants of Lord Krishna. By the middle of 14th.century, the Yaduvanshis adapted to Islamism and were named as ‘Khanzadas’. The fort has been witness to many historical battles. It was won over by the Mughals, then the Jats and finally came under the rule of the Rajputs in the year 1775. The Golden period of this fort lasted from 1882 to 1934 under Ranawat Thakur Bhawani Singh. 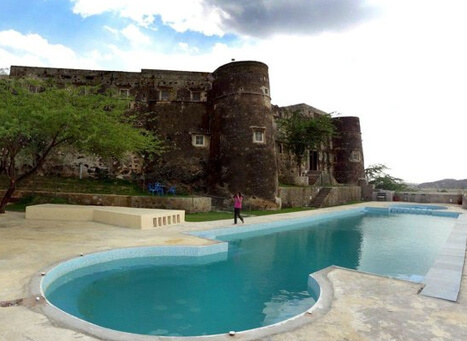 Built above sea level on a large rock, the design and layout of the fort is splendid. A robust wall runs around the fort with towers for the soldiers to watch out. The verandahs are arched. The main fort is mostly made of granite with numerous pillars for support. Granite facilitates a cool ambiance within the fort building. It has a square shape and within it are many large halls and rooms. The rooms have large windows. The roof is majestic. It can house 100 people. 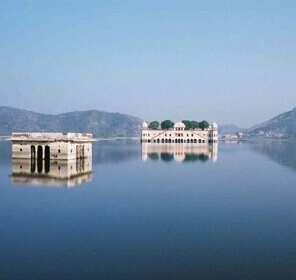 It is an ideal place to watch birds and get a view of Alwar. 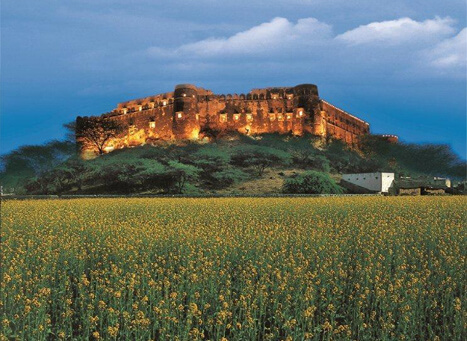 Owing to its historical and architectural significance the fort was declared a heritage site by Government of India. 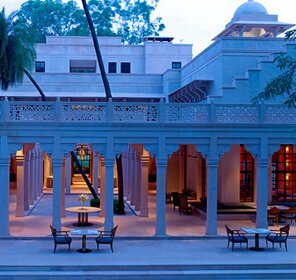 In 2004, it was taken on lease by the Neemrana group of hotels. 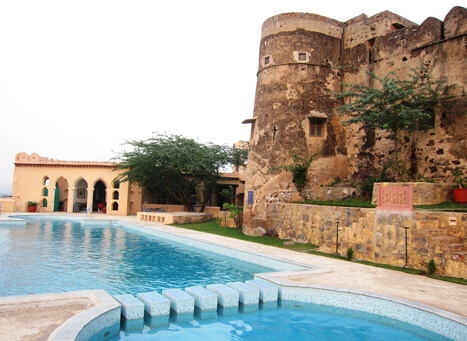 Living in a fort hotel can make you feel like a Maharaja. The gigantic rooms which uphold the majesty of the bygone era and pamper you with modern technology are ideal for detoxification of body and soul. The nomenclature of the room types can mesmerize you to feel like a King. 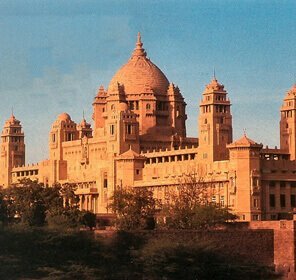 Rooms are named as Mubarak Mahal, Rajhans Mahal, Nirmal Mahal, Hindola Mahal, Maan Burj and so on. 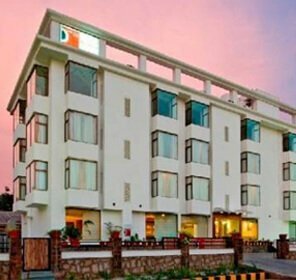 The hotel has thirty one rooms of which four are duplex suites, five are grand rooms, ten are suites and twelve are rooms. There are thirteen rooms on the ground floor, nine rooms on the first floor and nine rooms on the lower pool level. Each room has an attached bathroom. The best time to visit this site is from October to March. 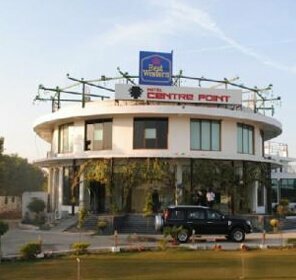 The tariff ranges from Rs.3,000.00 to Rs.14,000.00 as per room type. During the off season from April to August, the room rates are discounted further. The room rates are inclusive of daily housekeeping services and breakfast. Lunch and dinner are charged per person basis and provide fixed menus. Liquor is also served here. There are no televisions in individual rooms. Room service facility is not provided. You can therefore get engaged in exploring nature’s beauty on bicycle ride. 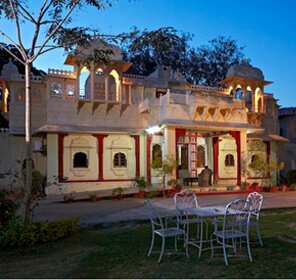 A tour to some other nearby tourist spot like Sariska tiger sanctuary can be adventurous. 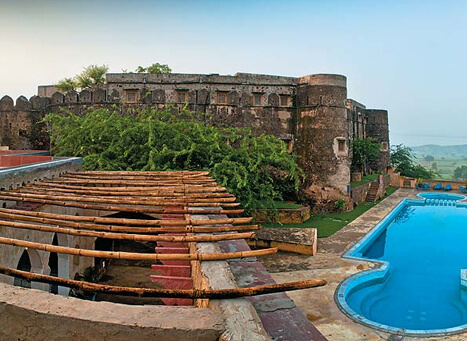 Being situated at the centre of the ‘Golden triangle’, Hill Fort Kesroli can be the tour base to many other places like Kankwadi fort, Neelkanth Temple, Bharatpur sanctuary, Mathura etc. Else, you may distress your tired muscles by availing the massage service or, going for a free swim. A game of badminton can actually tone your muscles. The indoor types can play chess, card or, carom. 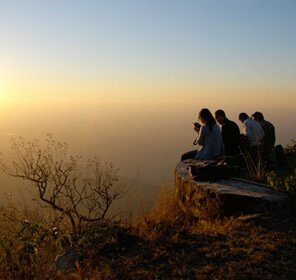 So, if you are planning your honeymoon or, pleasure amidst wilderness, Hill Fort Kesroli is the place.